Consumerism, the hidden driver behind all TV production? What TV news provision does the younger teen audience want? How can TV drama represent family experiences of long term ‘coma’? Prof Jenny Kitzinger and Erika Hossington: a potential new storyline involving coma next year for ‘Casualty’. 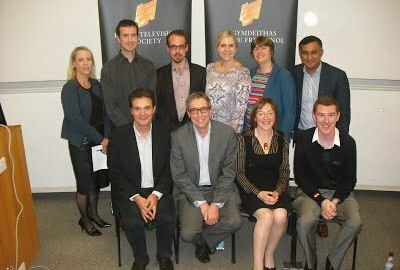 Dr Ross Garner and Mike Talbot: collaboration on producing tv in Wales for the mainstream. Dr Cindy Carter and Huw Foulkes: collaboration on News for young teenagers. “There are now plans to reflect adverts off the moon,” said Professor Justin Lewis as he argued that all television is ultimately driven by a hidden consumerism. That was just one of the many insights gained as the Wales Centre paired academics with television professionals for one-to-one dialogue and debate at Cardiff University’s School of Journalism, Media and Cultural Studies. Karin Wahl-Jorgensen reported that the BBC is still trapped in a two major party world when it comes to political reporting, while Jenny Kitzinger told us that the portrayal of people in a coma in hospital drama is not only wrong but actually misleads the public. Other subjects discussed included news provision for the younger teen audience and an attempt to define what the ‘mainstream’ means within commercial British television.